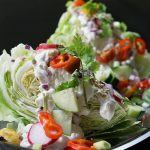 Wedge salad is a favorite and something we enjoy quite often. This is an easy salad, so simple to put together! Slice the lettuce head in half and again so there are four wedges. Remove the core & place the wedges on a platter. Slice & quarter the cherry tomatoes, dice the red onion & slice the green onion. Top each wedge with blue cheese dressing (this helps the other items to stick), cherry tomatoes, red and green onions & blue cheese crumbles. Sprinkle with fresh ground pepper.